a ball games hall of 13.3 m x 36.2 m with a normal size volleyball court and a basketball court slightly narrower at sides. Two badminton fields are marked. 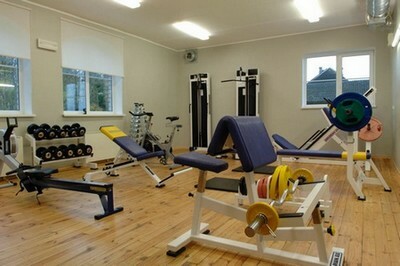 There is a gym and two changing rooms (one with sauna). Additional gear include two ping-pong tables and a boxing sack. Outside there is a asphalt-covered basketball court with two hoops and a volleyball sand-court.